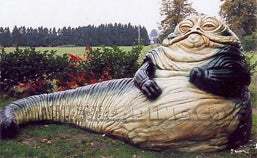 One thing notably absent from Jabba's list is a $13,000 full scale replica of himself, constructed of polyurethane foam, coated with a polyester medium layer. Think of the booby trap potential! Well, if Jabba doesn't want one, that hardly stops you from putting it on your own list.